What is baton-touch in terms of product oriented manufacturing systems? I have made a deep research about this on Science Direct and other resources but I can find nothing more than an inconclusive paragraph. In the baton-touch method, each operator performs a fixed subset of the cell’s operations, organized in a fixed sequence. It is commonly used in cells requiring three or more operators making a narrow range of products with similar work content. 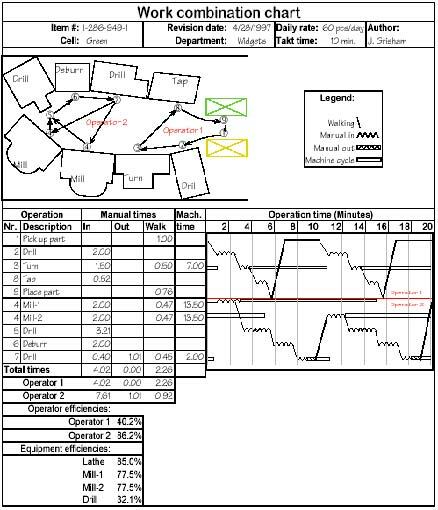 In the caravan or rabbit-chase method, the operators follow each other through the entire sequence of operations in the cell. It requires each operator to be skilled in all the operations of the cell, and works well with up to two operators but breaks down with three or more operators, as they queue behind the slowest member of the team. In the bucket-brigade method, the operators are in sequence, but the scope of each operator’s tasks varies. When the last operator finishes a unit, he or she takes over the next unit from the preceding operator, who in turn takes over from his or her predecessor, and so on, until the first operator, who starts the next unit. Bucket-brigades are used with a broad mix of custom or configurable products, and work when the faster operators are always downstream from the slower ones. For details, see John Bartholdi’s article on bucket brigades. 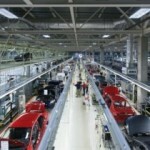 Most facilities that fail in a lean implementation have failed to create stable process flow. And by stable I mean statistically stable — a process that is predictable. (Wanna Sabotage Your #Lean Implementation Effort? The way I read Lonnie’s article, he is saying that neglect of the engineering dimension of Lean manufacturing is the primary cause of implementation failure. I agree. It is a long article, but worth reading. TEAMwork is St. Luke’s application of lean principles. It’s our management operating system. TEAMwork stands for timely, effective, accountable, measureable work. And it’s making its way through St. Luke’s Health System as we gain on our Triple Aim of better health, better care, and lower costs. Starting last summer, SLIM embarked on a top-to-bottom examination of how it conducted its work. They wanted to eliminate waste by tapping into the potential and knowledge of every member of the clinic team and build a culture of continuous improvement. The improvements described are all about supplies and the handling of patients by nurses and administrative staff. There is not a word about any changes to the work of doctors themselves or involvement by doctors in the improvement process. What form might that take? I don’t know, but, the last industrial engineers to work on health care before Lean were Frank and Lillian Gilbreth 100 years ago, and their focus was the work of surgeons inside operating rooms, not patient handling before and after they see a doctor. The result of their work was the now standard mode of operation in which the surgeon calls for tools that are handed to him by nurses. It seems hard to believe today but, earlier, surgeons would actually leave patients to fetch tools. Following in the Gilbreths’ footsteps today would mean for Lean Health Care to get involved with the core of the activity: what doctors do with patients. In manufacturing, successful Lean implementations start with the work of production on the shop floor, not with the logistics upstream and downstream from production. 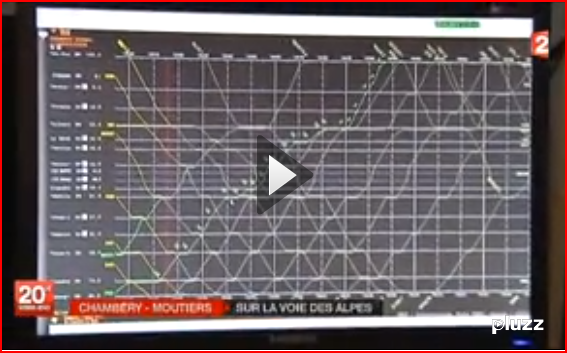 First you worry about line layout, work station design, and the jobs of production operators. Then you move on to keeping them supplied and shipping their output. 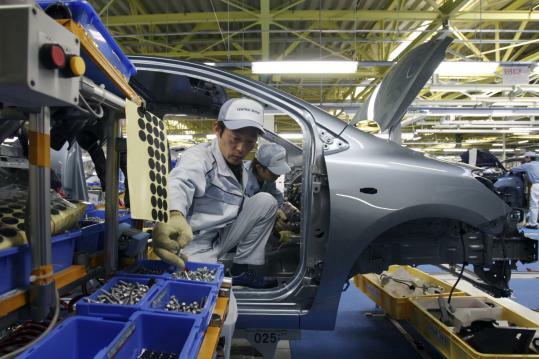 Toyota’s latest plants in Ohira, in Japan’s Miyagi prefecture and in Tupelo, Mississippi, feature new approaches to assembly. 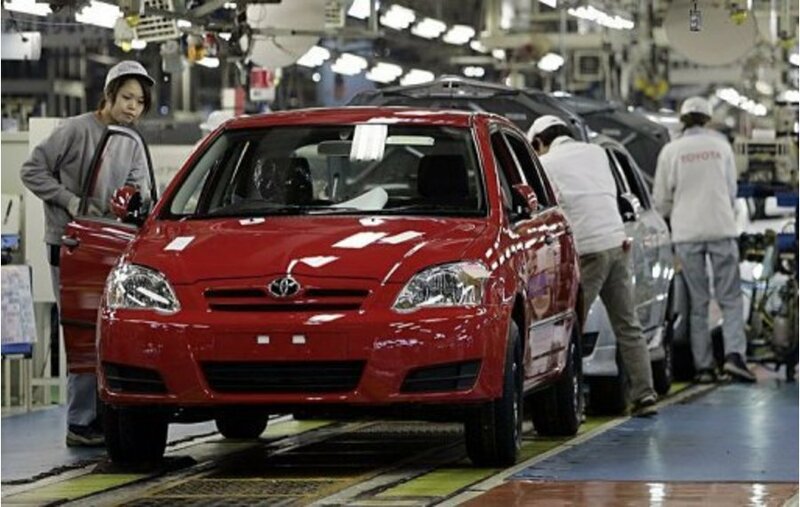 According to press reports, the Miyagi plant is small, with 900 employees making 250 cars/day for export to the US, with a plan to double output and employment. It was designed to require a minimal investment and be easy to change. The plant started operations shortly before the Fukushima earthquake and, even though it is the Northern part of Japan that was most affected, it resisted well and was able to resume operations about six weeks later. This is followed by a few conclusions. 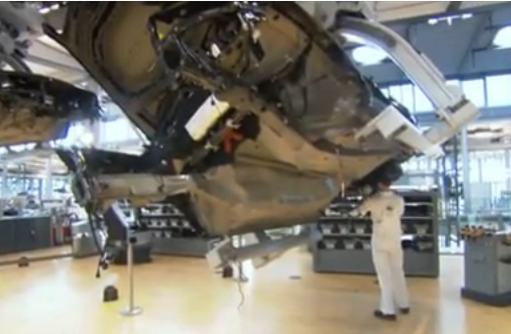 I have seen side-by-side assembly at the Volvo Bus factory in Turku, Finland. In the picture of the building below, bus bodies are assembled in the hall on the left, side-by-side under they are mounted on a chassis and move forward on their wheels, laid out front to back in the hall you see in the background. 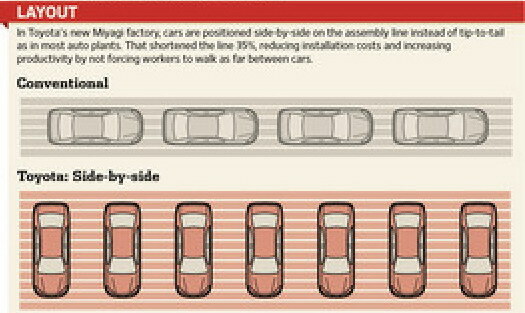 The ratio of width to length is more favorable to this arrangement for buses than for cars. A straight assembly line with a front-to-back arrangement throughout would require a long and narrow building and a snaking line would have problematic turnarounds. With cars, the side-by-side arrangement seems suitable for work done at the front or the back of the car, such as installing headlights or bumpers. but less for work that requires access from the middle, such as installing instrument panels or upholstery. 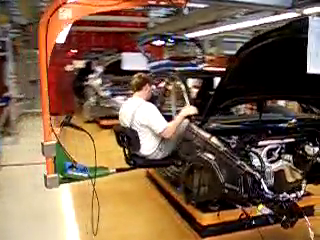 The following press picture (AP), however, shows an assembly operation done inside the car body in what appears to be a side-by-side layout. It implies that space for the part cart must be provided between cars, which forces them apart. None of the available pictures from the Miyagi plant shows the raku-raku seat that was a prominent feature of the early 1990s designs and made it easier for operators to work inside the car bodies. Not only is a raku-raku seat an added investment, but it is also easier to use in a front-to-back than in a side-by-side layout. 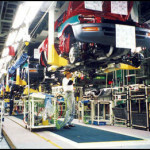 In this picture, the floor the operators stand on is flush with the assembly line, meaning that it is either a classical line with the drive mechanism in a pit under the floor, or the operators are in a raised platform spanning the length of this assembly line segment. Flexibility in vehicle widths. 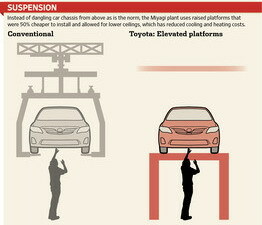 The Yaris and the Corolla differ in width by less than half an inch, and therefore the same elevated platform can accommodate both. A Land Cruiser, on the other hand, is 11 inches wider, which makes you wonder whether it could share an elevated platform with the Yaris. The jaws of the suspension conveyor, on the other hand, look adjustable to a broad range of widths. The journalists take on the Ohira plant is that it is intended to prove a design for low-volume, low-cost, high-labor content plants that can be deployed easily in emerging economies with small markets. The designs of the early 1990s instead used more automation to make the work easier for an aging work force, with tools like the raku-raku seat. This is a different direction, addressing different needs. But why build it in Northern Japan rather than, say, the Philippines? It shows Toyota’s commitment to domestic manufacturing in Japan, and it is easier to test and refine the concept locally than overseas. Does US manufacturing need more universities? The erosion in manufacturing capability weakened the U.S. economy over the past two decades, Atkinson and Ezell add. Universities have essentially contributed nothing to the art of manufacturing in the past, and I have a hard time understanding how they could be essential to US manufacturing competitiveness in the future.